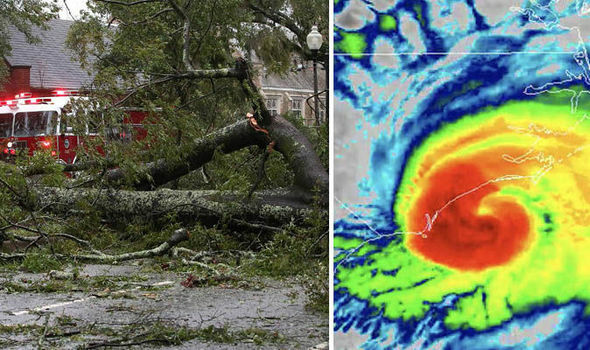 After storming the coastal areas of North Carolina on Hurricane Florence on Friday, high winds and heavy rains spread destruction in the area. Wilmington’s police said a woman died and her child fell on a house. Another woman died in Hender Attack by a woman in Pender County due to the fall of the trees roads and roads are closed and despite the information, the ambulance could not reach the patient’s home. North Carolina’s governor said that the fourth person was killed when he was shooting his generator. Authorities of Craven County have said hundreds of people have been shifted from safe water to the safe places. Authorities say they received more than 150 phone calls to help the New Bern town, because there is water in people’s houses. Hurricane Florence is constantly moving towards North and with coastal areas of Carolina states due to which the highways and rains have been drowned and rivers are flowing with their banks. The United States National Center for the Seafood has said now that Florence is gradually moving towards the south-east of North Carolina and its speed is up to 120 kilometers per hour. The American National Center also says that the storm will continue to move forward and will be in the south-east of Carolina along with Friday and weekends. Previously, the officers expressed this concern it will increase problems and troubles for millions of people after storming the coastal areas of the storm. The United States National Center on the Seafood has said that even though Hurricane Florence has declined and at the moment, he is on the second level of the storm-level five-level scale, However, Hurricane Florence is still dangerous and no prediction can be done. The Meteorological Department report states that the wind speeds are 165 kilometers per hour. And with severe rain, it can cause great disaster. Earlier, the American center had said that Friday could hit up to 40 inches after the collapse of the coastal town of North Carolina’s coastal town of Tropical. North Carolina’s governor has said that no one has invited Hurricane Florence but he has arrived here. He told the people that although the severity of the storm was reduced, but they should be alert and smart. Manage your safety; it’s a powerful storm that can kill.